There are numerous tales told about the brigand Kidōmaru. Often the same story is told in variant versions, as are all Japanese tales. It would be as though Shakespeare’s Hamlet was performed in 17 wildly and often conflicting different ways. Taking that into account here is the synopsis of one recounting of Kidōmaru and the ox skin. Making a long story short, the bandit/strongman Kidōmaru had been captured by Yorimitsu’s younger brother. When Yorimitsu happened to stop by he was shown Kidōmaru tied to a tree. Warning his brother that ropes were not strong enough to restrain such a villain, iron chains were added. This earned Kidōmaru’s enmity for Yorimitsu. Or, it just increased it according to which story you want to believe. That night Kidōmaru broke free and was determined to kill Yorimitsu. He climbed up to the roof and was going to attack from there, but our hero was on to him. Determined to avoid such an assault at the home of his brother Yorimitsu and his men left saying they were going to make a pilgrimage to a temple. Foiled, Kidōmaru left too. While traveling across a plain Kidōmaru came across a herd of wild oxen. He struck one on them three times on the head causing it to fall dead at his feet. Being a remarkably strong fellow he stripped off the dead beast’s skin quickly and covered himself with it, lying in wait for his new arch-enemy to pass through the area – which he and his men soon did. However, Yorimitsu was nobody’s fool When he saw the ox skin he ordered one of his lieutenants to shoot an arrow into it. With that Kidōmaru flung the hide aside and jumped up. He went at Yorimitsu, who sat unperturbed upon his horse, with a vengeance. Yorimitsu had drawn his sword and after a few brief parries he cut off Kidōmaru’s head. This would have stopped any normal human being, but Kidōmaru’s body kept up the attack until it collapsed seconds later. This account is based on Warriors of Old Japan by Yei Theodora Ozaki, 1909, pp. 135-144. 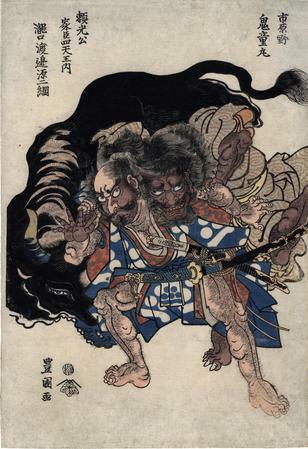 In the full diptych Yorimitsu, on horseback, is accompanied by two of his strongmen companions when they find Kidōmaru, the outlaw bandit, hiding under the skin of an ox. They subdued him. There is another printing of this sheet with the publisher's seal of Morita Honzō (Marks 352 - seal 04-010).